On July 8, Medicare announced plans to reimburse physicians, nurse practitioners and physician assistants for services to help their patients plan the care they would want if they were too ill to speak for themselves. If approved, the plan will take effect in January 2016. I am a palliative care provider and a researcher in end-of-life care. In my experience, these kinds of services, called “advance care planning” (ACP), are incredibly valuable, especially to patients who are older and their families. My colleagues and I have found that 43% of elderly Americans require decision-making at the end of life about such things as life support and CPR. But 70% of them lack the capacity to make those decisions for themselves or to communicate them to others. Reimbursing these services removes one obstacle to making sure that patients actually receive advance care planning. It will signal to clinicians that ACP is something Americans value to the point that they are willing to pay for it. That, in turn, will empower Americans to demand and expect this necessary, but often neglected, service. No longer will clinicians have the excuse of nonpayment as a reason for failing to do it. As it currently stands, ACP sessions cannot be billed for as the sole reason for a clinical visit. That, we believe, is one major reason that physicians (in particular) do not set aside the time in their busy schedules to do this. ACP conversations can be long (30–90 minutes, in my experience) and cannot be rushed – they take the time they are going to take. Additionally, ACP discussions can be emotionally taxing. Talking about illness and death is something no one, not even the clinician, enjoys. In our work with primary care physicians, we find they often set aside discussions about ACP when they have other, less important things to do. In this age of short visits and competing demands, it’s no wonder. In ACP, clinicians ensure that patients and families understand the patient’s current health status and those medical conditions he is at risk for. Together, they explore the patient’s values and discuss how he would like those values reflected in his care. They explore whom the patient would trust to make decisions on his behalf if he could no longer speak for himself. Sometimes patients are able to clearly voice their preferences, but often they need to think about and discuss their situation further with family. Thus, ACP often occurs over many encounters, throughout the patient’s life. ACP means you get the care you want. 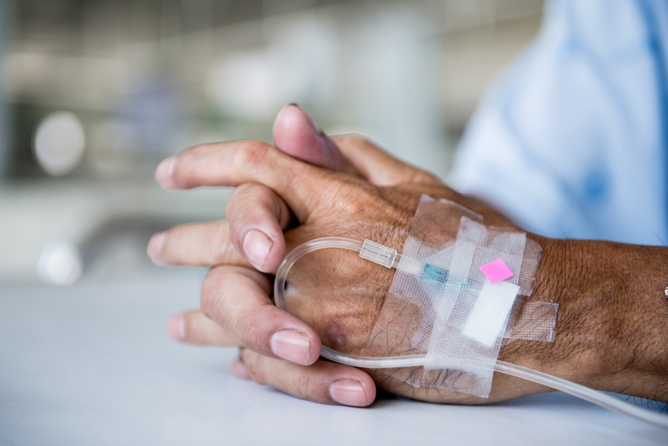 Patient with IV via www.shutterstock.com. It is important to recognize that when we talk about ACP, we are not talking about anything remotely like that. Advance care planning conversations occur between an adult who is capable of making her own decisions and a trusted physician. The conversations are entirely voluntary. Patients can always refuse to engage. Moreover, physicians enter these conversations without an agenda. Their only goal is to ensure patients get the care they want and can benefit from (because not all care is beneficial – studies have shown that when it comes to end-of-life care, less is more). Successful ACP is not measured by which decisions the patient makes (for more or less care), but by the ease with which patients and their families make decisions when the time arises, and how care matches up with the patient’s preferences. In fact, we often end up advocating for the patient to receive more care, rather than less, because that is consistent with the patient’s goals. Indeed, there is no evidence that ACP hurts anyone. Patients who engage in ACP or complete an advanced care directive are no more likely to die than anyone else is. In our research, elderly adults who completed an advanced directive for care were less likely to receive life support and CPR, but that is only because they wanted it that way. Most elderly adults prefer less invasive measures over life support and CPR even in the best of circumstances. Most patients and families welcome ACP discussions and find them stress-relieving rather than anxiety-provoking. ACP discussions have been shown to improve the likelihood clinicians understand and comply with patients’ wishes and increase the likelihood patients die in their preferred place. We also find that when patients put their wishes in writing (in the form of an advance directive), they are more likely to receive the care they want, less likely to die in the hospital and more likely to have the surrogate decision-maker of their choice. And people are putting their wishes in writing more often than ever before: in the last decade, we saw rates of advance directive completion increase from 47% in 2000 to 72% in 2010. This increase is likely related to the aging of the baby boomers, the very generation that gave birth to patients’ rights. Patients and clinicians should be able to have the conversation about advance care planning without having to worry about time and money. Medicare’s proposal to reimburse clinicians for this essential service is a great step in that direction. The proposal is open for public comment until September 8 2015. Hitler ... a Bavarian genteman?